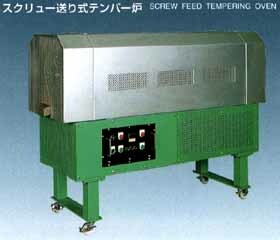 Tempering ovens are used to thermally temper springs in order to relieve residual tension remaining after forming. (4 rpm drum speed) 8.0min. capacity 350c 1.5kg/min. 350c 5.0kg/min. mechanism to increase thermal efficiency.